In 2002, the hype for Japanese horror films was declining rapidly, as the sequels to series like “Ring” or “The Grudge” were commercially and critically unsuccessful. Even though directors such as Hideo Nakata and Takashi Shimizu came to Hollywood to helm the remakes to their films or their sequels, Hollywood had already adapted J-horror tropes to its own productions. As Jerry White points out, one of the perhaps most disappointing entries in the J-horror remakes was Jim Sonzero’s version of Kiyoshi Kurosawa’s “Pulse” (2001). Perhaps it was this particular experience which made Kurosawa change genres with his next project “Bright Future”. In general, Kurosawa is best known for his unique horror films such as “Pulse” or “Cure”, films which years after their release now unfold their true impact. At the same time, the director has also repeatedly explored the gap between youth and adults, for example, in his 2008 film “Tokyo Sonata” which also won the prize of the jury at the Cannes Film Festival in the same year. “Bright Future” explores similar issues about the aimless youth clashing with the equally disillusioned adults as well as possibilities to bridge the gap between two generations. For many years, the lives of Yuji (Jo Odagiri) and Mamoru (Tadanobu Asano) have been divided between their rather dreary work at a laundry plant and hanging around in their apartments. As they are offered a raise as well as a permanent position at their company by their boss, Mamoru acts indifferent while his friend does not know how to react. When their boss suddenly wants to join in on their free-time activities and visits them at home, both men are equally disturbed by the change in their lives. While Yuji still tries to figure things out for himself, his friend takes matters into his own hands and after quitting his job, he is arrested for the murder of his boss as well as his family. Shocked by the chance of never seeing Mamoru again in freedom, he befriends his friend’s father (Tatsuya Fuji), who is equally saddened by the events. With only Mamoru’s pet jellyfish as a memory, Yuji is forced to face an important decision without the help of his friend. Considering the core theme of the film, one of the most important scene centers around Tatsuya Fuji’s Shinichiro and his second son Fuyuki (Ryo Kase). Obviously estranged from one another, the meeting between the two mirrors the bars separating the father from his other son with one decisive difference. In a sad, ironic twist, talking to Mamoru, while still difficult, has become somewhat easier, even though they have not seen each other for many years, whereas the discussion with Fuyuki only furthers the chasm between parent and son. The attempts to re-connect emotionally are shrugged off by Fuyuki’s interest in money as his world view is defined by the capitalist needs, a system which has started to ruin him. In his review of the film, author Jerry White points at the omnipresence of Western labels during their meeting, signifying how Fuyuki’s “soulless materialism” is connected to “foreign influences”. Indeed, this raises the question for all of the character how commercialism actually determines their actions and the “bright future” which is hinted at in the title. On another level, the existence of these thematic layers in his work marks the “typical” Kurosawa film, as Tom Mes points out. Whereas the style, the images and the use of sounds is all too familiar to fans of the director, it is also the question which lies at the core of every film Kurosawa has made in his long career, one which in this case relates to our society today. Mamoru and especially Yuji are more or less “slackers”, the former with the added “antisocial tendencies” which makes him more active than his friend. Rebellion, as Mamoru has seemingly found out, has become a meaningless label like “Heineken” or “McDonalds”. Fittingly, a group of teenagers Yuji meets later on, wear T-shirts showing the well-known face of Che Guevara, a sign for revolution but in this case also a powerless gesture. Since acts of destruction and theft will be stopped by the authorities and have no lasting impact, something more radical has to happen. Overall, the world Kurosawa and cinematographer Takahide Shibunashi present is defined by commercialism and a distinct numbness. 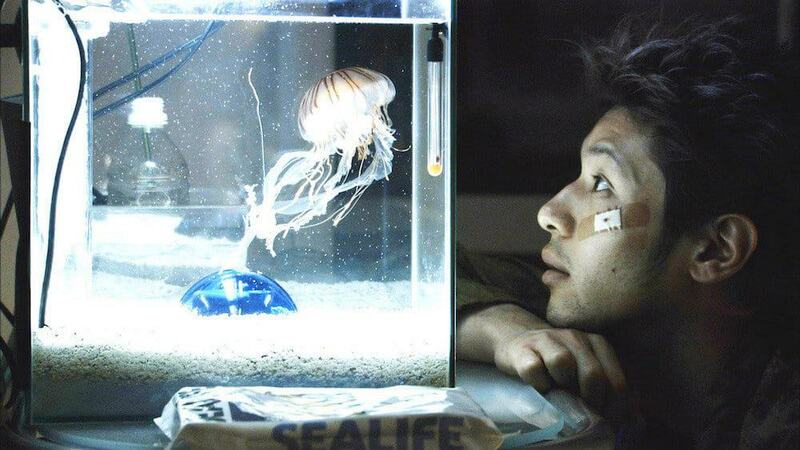 Much like the jellyfish Yuji is so fascinated with, it is cold, dreary and filled with characters attempting to break out of this depressive bubble. In a performance reminiscent of characters from Takashi Miike and Pen-ek Ratanaruang, Japanese actor Tadanobu Asano plays the catalyst for a different kind of revelation and revolution. Even though Odagiri’s Yuji may not be as well written as Fuji’s, their scenes reflect the longing to bridge not only a gap, but also come forward with the promise of a “bright future” for yourself and others. In the end, “Bright Future” might not be the accessible work of Kiyoshi Kurosawa, but it is one of a mysterious beauty and depth. Even though some actions, as also Jerry White mentions, may not be logical, the outcome is a film which will stand as a counterpart to the often apocalyptic endings of his horror movies like “Pulse” and “Cure”. White, Jerry (2007) The Films of Kiyoshi Kurosawa. Master of Fear. Berkeley (Cal. ): Stone Bridge Press.